Not too long ago, I was trying to demonstrate how NOT taking full advantage of your 401k matching contributions offered by your employer was causing you to lose out on more money over the course of your career than you probably thought! While it’s never too late to get your personal finances in order, one simple mistake I see people making all the time that kills me is when they wait as late as 5 to 10 years before they finally get with the program and start contributing enough to their retirement plan to get the full 401k matching from their employer. I beg you – Please don’t waste another year! Remember time is one of your greatest assets as an investor, so don’t squander it! 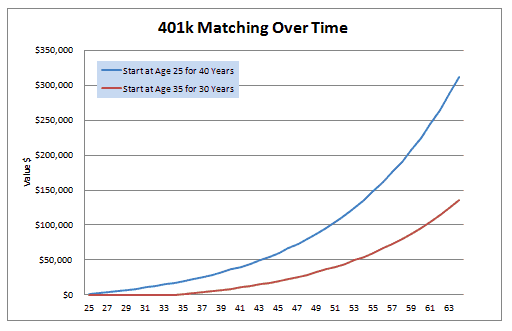 In this post, I’ll show you just how powerful taking advantage of your full 401k matching from your employer as early as possible can be for you. Now in this example, let’s say that both employees working for Company X at age 25. Employer 1 starts off aggressive! He invests in his 401k plan to get the full match of $1,200, and he does this for the next 10 years. Then for whatever reason (new job, other investment opportunities, etc), he stops! He never invests in that retirement plan again and never receives another dime from his 401k matching either. Employer 2 starts off lofty. He doesn’t invest in his 401k for every excuse you can imagine, and he passes up the free money 401k matching for the next 10 years. Then at age 35 after he reads his favorite blog, My Money Design, he realizes his mistake and takes full advantage of his 401k to get that $1,200 employer matching. My question – By age 65, who has more money? The employee who saved early for only 10 years or the one that started late and saved for 30 years? The answer: Employee Number 1 would have more money! $38,988 more! Yes, if you assume an annualized average 8% return from investing those employer contributions in something like a stock market index fund, then Employee 1 will still have more money than Employee 2 even though Employee 1 hasn’t added to his investment plan in 30 years! How is that possible? That’s just the power that compound interest has on investments and why time is such an important asset! The more money you can build up as early as possible, the greater potential it has for turning into a substantially sized fortune! Now Employee 1 has over $174,928 more than Employee 2. And all in just extra 401k matching contributions. Not a bad return for using a little bit of strategy! 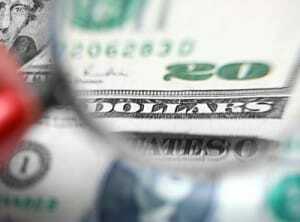 Readers – Did you start getting your full 401k matching from your employer right away, or did you wait? If you waited, what was your reason? Will this example change your mind? 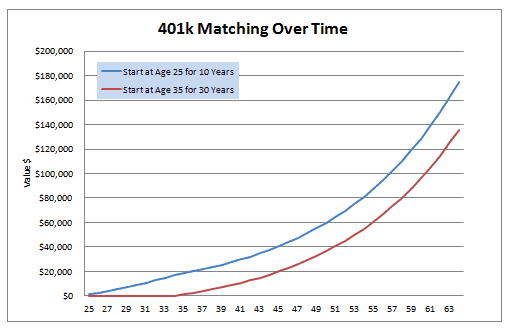 2) Maxing Out Your 401k Matching – Don’t You Dare Leave Money on the Table! Maxing Out Your 401k Matching – Don’t You Dare Leave Money on the Table! What’s the Difference Between a 403(b) vs 401(k)? I love explaining to people about the power of compound interest. So many people fail to realise just how big of an impact it can have over the long term. Thanks Glen! I love see how carried away charts for compound interest can get. It is unreal to think that such a little sum of money could amount to something so large over time. Great post! I started pretty much right away in putting money in my 401k as the free money was just too hard to pass up. Many lose sight of the fact that time is just as important, if not more so, than the amount of money you’re putting away. Time can work wonders on your investing if you’re doing it right. Unfortunately many people don’t realize this until its too late. Hopefully reminder like this can persuade them. We did right away. It became apparent to me very early on that there isn’t a lot of “free money” to be had in life and that I should pounce on any free money that comes along. You’re absolutely right. There’s not a lot of free money out there in the world. So get while the getting is good! My first two employers didn’t match, they just contributed. I now have an.employer that matches and I took full advantage from day one. I like free money! An employer that has a 401k match is somewhat like getting an extra bonus of income that you were planning on saving anyways. Many people under-estimate how well this can play into their compensation. Either way, you’ll be growing money tax free. We started contributing to my wife’s 401k a year after she started. It was one of the best financial moves for us. The company match basically adds 4% to her income.It’s like receiving an extra raise. I don’t see why more people don’t take part. It’s free money. It’s such an easy thing to do. I don’t know why more people don’t either. I don’t have a 401k but when I get it I plan on contributing the full amount to get the match (if they offer it). Based on your charts, it’s a no-brainer! Anything that is free + compound interest potential + tax free benefits is a no-brainer. I hope that you are able to find an employer that can compensate your talents as they should be! I definitely contribute at minimum the matching amount in contributions to my 401k. There is no reason not to; if you don’t you are simply leaving money on the table. Exactly – why pass is up! We started getting the match right away. In-fact, we’ve been contributing to my wife’s 401k when her employer isn’t matching the contributions. Her new job requires that she’s been there a year before they start matching contributions (she’s been there 6 months). Jason recently posted..How Does Life Insurance Work? A lot of places have rules on vesting and other waiting periods. That’s pretty normal. As long as you plan to be there for any length of time, you’ll be just fine and should have no problem getting what you are entitled to. Plus all the money you’ve saved even without the 401k matching will grow tax free, so there’s still a lot of good benefit. I love those charts. How is it that visuals tell such a great story? The power of graphs make a far better point than I could ever explain. I’m glad you enjoyed them, Joe! I love your chart! I have a chart of my own where I track my 401k balance, along with several different graphs with various contribution scenarios. It’s good to see a fellow financial chart geek out there, lol. I started contributing to my 401k and getting the match as soon as I was eligible. My company automatically contributes 2% whether you contribute or not. They also match dollar for dollar on the first 4% and then 50 cents on the dollar on the next 2%. So I contribute 6%, and my employer kicks in additional 7%! Justin, since everything I do basically makes it into a spreadsheet, I could make charts and graphs all day long! It just does such a better job of making your point when you can illustrate it! You’ve definitely got a fellow financial chart geek friend here! I have made some dumb financial moves, but have always contributed to my IRA, to get the match at first, and now I max it out. Compound interest is like magic. Saving to a tax advantaged account is always pretty solid. I’m looking forward to putting more into the IRA next year!